Armaan steps in and impresses Sofia by being a gentleman. It’s a new day for the Bigg Boss housemates and everybody is trying their best to survive amidst a tense atmosphere filled with arguments and quarrels. To start off,Armaan Kohli has promised that he will refrain from getting into a fight with any of the housemates,he is seen trying out new things to keep himself calm and composed. Further solidifying his thought,he decides to take yoga lessons from Sangram for the sanity of his mind. Gauahar is seen sitting quietly in a corner and sobbing while caressing Heaven. She tries to hide her thoughts and prefers not to talk to anybody. Sofia and Andy are meanwhile discussing Kushals entry in the house again where Andy tells Sofia that he is scared with the thought of Kushal coming back and will never support this decision. He also adds that Kushal Tandon should apologise to him first and should feel guilty about whatever he has done in the past. Further,Bigg Boss makes an announcement regarding the nominations procedure and asks all the housemates to give two names they would want to nominate in the confession room. Kamya being nominated by Candy is already on the list while Elli being the captain is safe from nominations,is given the special power to nominate one contestant from the rest of the inmates. Tanishaa and Armaan notice Gauahars indifferent behaviour and are seen discussing about it. Armaan tells Tanishaa that she is disturbed owing to Kushals absence and will get back to normal once he comes back. Ajaz and Gauahar are seen spending some time together where he is trying his best to make Gauahar laugh and pull her out of her depression. 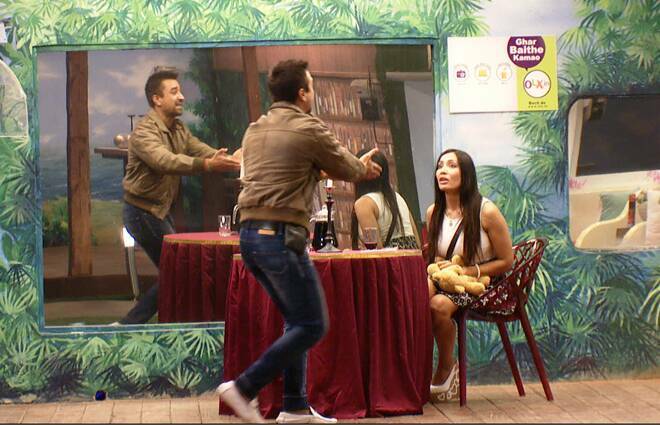 He tries all kinds of antics and finally manages to bring a smile on Gauahars face. Further,Bigg boss announces a task for Elli and Sangram,where they are asked to bathe Heaven and dress him up in funky clothes. At the same time,Andy and Tanishaa are discussing about Gauahar and her behaviour with the housemates. Tanishaa advices Andy to befriend Gauahar like before and clear all the misunderstandings that will help him continue in the game. In the evening,Bigg Boss calls Sofia in the confession room where she finds all her new clothes and footwear displayed on the table. Sofia starts jumping with joy when Bigg Boss interrupts her and gives her a secret task in order to win all her things. Bigg Boss asks her to go on a speed date with all the men of the house including Armaan,Andy,Ajaz and Sangram but she has to drive away any two of them in order to win. While Sofia is seated in the garden area,Andy is the first one to make an attempt to impress Sofia. He gets her chocolate and impresses her with his humour and courteous behaviour. Sangram is the next one to try his luck but Sofia is successful in knocking him down by being rude with him. Further,Armaan steps in and impresses Sofia by being a gentleman. Sofia tries her best to shrug him away but is unsuccessful in doing so. In the end,Ajaz tries his luck but gets petrified by Sofias irate behaviour and runs away. At the end of the task,Bigg Boss asks Sofia to announce the name of the winner and also tells them about the secret task that Sofia was assigned with. Sofia chooses Andy as the winner and walks away with all her goodies. As the day comes to an end,Ajaz is seen passing comments over Pratyusha being the youngest member of the house which irks her. While he is trying to have a conversation with her,she completely ignores him and walks away. After Ajaz asks her the reason,she tells him that he has no right to make any personal comments or poke fun at her. Pratyusha goes crying to Andy and tells him that she does not like the way housemates are behaving with her. At midnight,Kamya is seen advising Ajaz and Andy regarding their behaviour with Pratyusha and asks them to take her more seriously rather than poking fun at her.